Today, the Eastbourne Eagles celebrated the start of the 2016 season at the Arlington Stadium, kicking off the new season with their press and practice day. The event was combined with a corporate networking event, which was organised by headline sponsors IT First and Managing Director, Paul Goldsmith. IT First took headline sponsorship of the Eagles at the beginning of the 2015 season and have so far been instrumental in driving new corporate sponsorship for the Eastbourne Eagles. Today, they kick-started the new season by orchestrating a corporate networking event, with the intention of brokering more long-term relationships with companies to aid the running of the club. The event was a great opportunity for business owners to see the speedway close up, experience a taster of the atmosphere, and establish value in joining the club for the forthcoming season. The event allowed business owners and fans to have a first look at the new season's team and events; really giving them insight for what's to come. The track played host to a mix of youngsters, old riders and the new 2016 team. IT First shall be fundamental in supporting the Speedway again this season, advising the owners Martin and Connor Dugard for what hopefully will be another fantastic year. 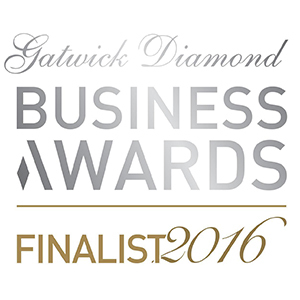 We are delighted to announce that we are finalists at the 2016 Gatwick Diamond Business Awards for the Responsible Business Award! The 'Responsible Business Award' recognises exceptional businesses who demonstrate responsible business practices in Sussex which benefit their reputation, customers, staff and the local community. At IT First we are involved in many schemes which support the local community, including our investment into local Speedway team, the Eastbourne Eagles. We have been working alongside the club to improve the links with the community including fan engagement and charity work. In our first year representing the Eagles as headline sponsor, the team have won three cups; the Gold Cup, Knockout Cup and the National Trophy. We are also a founding partner of the 'Be The Change' initiative with LoveLocalJobs.com which aims to inspire and educate students in Sussex to consider their future career options and teach them about the world of work. At the launch event, we helped mentor over 100 local students through employability workshops, with a focus on improving their skill set outside of the academic spectrum. We have also gone on to work individually with some schools in Sussex working with the students to help with employability readiness. After being highlighted as ‘One to Watch’ at the Sussex Business Awards being shortlisted for another award is a fantastic achievement and is reflective of the on-going effort that the whole team have put into making IT First the company that it is. We look forward to seeing everyone at the awards and wish all of the other shortlisted businesses the best of luck! 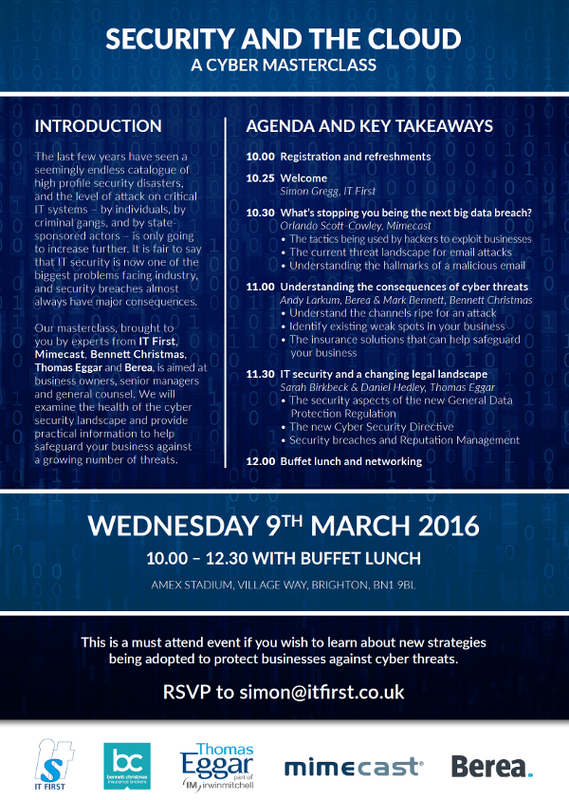 On Wednesday 9th March 2016, IT First, Bennett Christmas, Thomas Eggar, Mimecast and Berea will be hosting a Cyber Masterclass at the Amex Stadium.